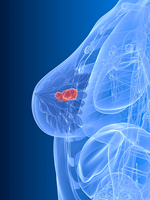 Copenhagen, Denmark—Measuring the Ki67 protein, along with traditional risk factors such as tumor size and molecular characteristics, may make it possible to avoid sentinel node biopsy in women aged >50 years with breast cancer. Higher Ki67 values were associated with larger tumor size and increased likelihood of axillary node metastasis in women aged ≥50 years, regardless of hormone receptor status or HER2 status, reported investigators at the recent European Society for Medical Oncology Congress. “We may have found an indirect way of evaluating nodal status in a small subset of patients, thus sparing them some invasive procedures,” said lead investigator Giacomo Bregni, MD, IRCCS AOU San Martino and the IST-Istituto Nazionale per la Ricerca sul Cancro, Genova, Italy. The Ki67 protein is a marker of cell proliferation that indicates tumor aggressiveness. However, routine use of Ki67 as a marker remains controversial. The study presented at the European Society for Medical Oncology Congress was based on 1785 patients treated for early breast cancer (stages T1-2, N0-N1) at the National Cancer Institute of Milan. In that study, higher Ki67 values were significantly associated with larger tumor size and increased likelihood of axillary lymph node metastases in women aged ≥50 years (P <.001), with no substantial differences according to hormone receptor or HER2 status, whereas no association was found be­tween Ki67 values and axillary lymph node metastases in patients aged <50 years or with smaller tumors (<10 mm). The odds of axillary lymph node metastases increased by 42% for each additional 5-mm increase in tumor size in all breast cancers except triple-negative cancers. “Ongoing studies are evaluating axillary surgery and sentinel node biopsy in breast cancer, and it could be worthwhile to consider stratification based on tumor size and molecular characteristics, including Ki67,” Dr Bregni told listeners. He added that it may be redundant to discuss axillary surgery in patients with exceptionally good prognosis, and in patients with poor prognosis who will be offered chemotherapy and radiation. Clinical trials should consider evaluating whether axillary surgery and sentinel node biopsy can be avoided in patients aged >50 years with small tumors, low Ki67, and triple-negative breast cancer, Dr Bregni suggested. “The present, single-institution study is hypothesis-generating, and suggests that patients with exceptionally good prognosis according to age, tumor size, and low Ki67, as well as triple-negative patients, are at such a low risk of axillary node metastases that they may be spared sentinel lymph node biopsy,” Dr Viale concluded. Source: Wang J, Sang D, Xu B, et al. Value of breast cancer molecular subtypes and Ki68 expression for the prediction of efficacy and prognosis of neoadjuvant chemotherapy in a Chinese population. Medicine (Baltimore). 2016;95:e3518.